The Other Half is a slice of Americana spiralling out of the music into the gritty realism of real life, real bars and the notion that occasionally a dream evaporates into a sense of reality. 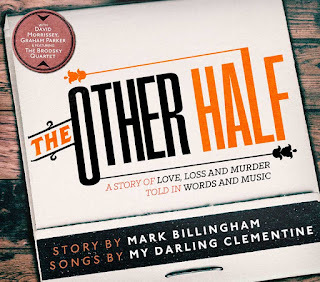 The spoken word, the written word and the poetically sung word entwine in a tale of nostalgia, intrigue and hope as the songs of My Darling Clementine merge seamlessly with the prose of top fiction author Mark Billingham. This is not your usual format for ‘three chords and the truth’, but it’s a wonderful take on the concept and will keep your ears glued to a listening device as the montage of collaborative art unveils. Prior to this single hour-long recording hitting the stores there were two key moments to ignite the eternal flame, or a little less pompous, a collectable souvenir of the time two factions of the arts world met with such ethereal effect. You only needed a single listen to My Darling Clementine’s debut album HOW DO YOU PLEAD to identify the conceptual potential and let the imagination loose on numerous possible alternative creative developments. 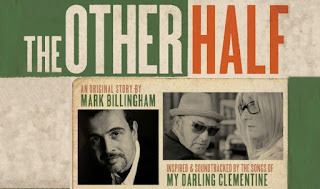 Far from taking the obvious route, Mark Billingham ventures down a path only the highly imaginative would foresee and adapts a number of tracks from subsequently both My Darling Clementine albums to succinctly weave them into his subtle tale of everyday life. The project initially had its airing in the theatres of the land last year and you couldn’t help thinking that it wouldn’t be too long before a more permanent format evolved. True to this piece of not too difficult hindsight, the audio recording in both physical and digital formats has emerged courtesy of Hachette Audio with the splendidly packaged CD containing the narrative for those preferring to mix their media consumption modes. With the help of a couple of guests and the usual audio background accompaniment, Mark narrates the story which has the likable character Marcia at its core. Seven songs by My Darling Clementine are strategically segmented into the script of which five appear on their albums and a final one a commissioned effort by all parties involved. 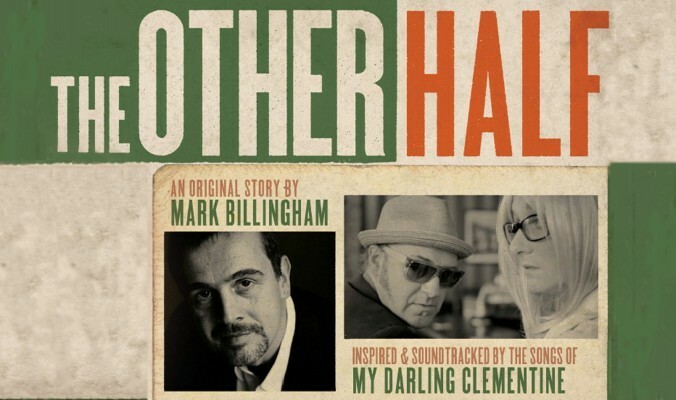 My Darling Clementine has taken the UK country and Americana scene by storm over the last couple of years and is the brainchild of husband and wife team Michael Weston King and Lou Dalgleish. This latest project by two highly experienced performers, while a visual tongue-in-cheek take on the classic duet era of country music, is a far deeper musical presentation revealing a much loved facet of the genre and has delighted fans far and wide. The versions of their songs used for this recording are more stripped backed efforts than you will hear on the albums, but are perfectly in tune with the sparse theme of the lives of the characters involved. Mark Billingham is best known for crime novels and his creation DI Tom Thorne has featured in works successfully transferred from the written word to television. Mark also doesn’t hide his love for country music and this twin passion has kept the music of My Darling Clementine fresh as the band ponders their next move. His co-write with Michael and Lou, ‘As Precious as the Flame’ acts as the tale’s finale and as you would expect from any top author, the ending raises a few eyebrows in lieu of the preceding sentiment. So if you want to further delve into this poignant, stark and moving story set in a downtown Memphis bar against a backdrop of serious character study and the flickering of hope then grab yourself a copy of the recording before sitting back to savour the content. It’s a quality piece of Americana fiction presenting the very best of what two performing entities have to offer.